Are you trying to take your leadership to the next level, but struggling each step of the way? Are you wishing you could get help from someone who has been through leadership challenges and continues to make it through? Well, if that’s you, I want to let you know that I still have some open coaching spots available for free leadership coaching sessions. Send me a quick email at brandonwjones@leadershipdoneright.com, or message me on Facebook, LinkedIn, or twitter to let me know that you’d like to schedule your free coaching session today! Alright, so let’s talk about challenges new leaders face in the corporate world. Before we get into the five challenges, I want to explain how I arrived at these five challenges. I got these challenges from the feedback I have received from listeners like you, a variety of searches on Google and from my own leadership experiences. As I put the list together, I found there were many points and angles but the majority fell into these five categories. The first big challenge new leaders face is the internal expectation to know and be everything. I say internal because it often isn’t an expectation set by others, but rather an expectation that we have for ourselves. That got me thinking about where that expectation comes from… I think we add that pressure on our selves because we want to prove ourselves, make our mark, and be the leader we always wished we had. We also give ourselves that expectation because we expect to be better than our previous leaders. We forget, however, that it took time for them to get to where they are. When we think that we must know and be everything, we often begin having challenges with our self-confidence, feel we must have immediate success, and even can get the imposter syndrome. I just recently heard about the imposter syndrome. It is that feeling you get thinking that you got yourself in over your head because you are not good enough or smart enough for the leadership role you are in. With that, there’s a feeling that “one of these days everyone will find out that I am an imposter and I am really not cut out for my current role.” Now, that is a very real syndrome and I must admit, there have been times in my career that I have felt that way. Let me be the first to say that you don’t need to know and/or be everything. It just isn’t possible. If you are feeling the imposter syndrome, do your best to learn all you can, surround yourself with great people, then work to develop a strong sense of teamwork. Your job as the leader is not to be the oracle of all wisdom and knowledge, rather you are there to create a strong working team that can create greatness together. The second challenge new leaders face is maintaining a balance between screen time and face time. Screen time is the time in front of the computer and face time is the time you spend with those you lead. This is a challenge for two reasons. Most new leaders come from a background where they were expected to do a lot of work and were involve in the integral details. As a new leader, there is a transition from doing everything to overseeing and interacting with those you lead. Additionally, there’s just the challenge of learning where you fit in as the leader and defining your role. During this time of transition, although there is a desire to sit at the computer going through emails, receiving online training, or doing others tasks to learn the leadership role, do your very best to spend time with those you lead. As you spend time with them, you will develop stronger bonds of trust and respect. That brings us to our third challenge which is developing trust with those you lead. Trust is always critical, but especially as a new leader. During the first six months to a year, people will observe you very closely. So how can you take advantage of this time to develop trust? There are many things you can do to develop trust and they vary depending on the type of people you lead. There are, however, a few common principles you can follow to enhance your leadership and encourage trust. Do your best to have positive interactions with those you lead. Get to know them by showing genuine interest. This goes a long way. Also, listen to their concerns. Ask them what they would do if they were the leader and why they would do it. Find out what is going well for them and what they would change to make things better. Then, get to work! Do your best to get to the bottom of their concerns and address them. You likely won’t be able to solve every problem, but putting forth your best effort will help develop trust. Then, make a point to follow-up with those you lead to let them know what you’ve done and how things are coming along. If you will be changing things, this is a good way to let them know. And, if you’ve done your homework but won’t be changing anything, explain why things are the way they are to help people better understand the situation. Check out episode #46 for additional points on effective follow-up and follow-through. Alright, welcome back! The fourth challenge is knowing and identifying the difference between leading and managing. As a new leader, you may wonder what the difference is between the two, or you may think that you are always leading and never managing or vice versa. There is a distinct difference between leadership and management. Having an understanding of each will help you to be a better leader and manager! So, first let’s look at what it means to manage. The Google dictionary defines management as, “the process of dealing with or controlling things or people.” In layman’s terms what does that mean? Well, managing people is a task-oriented and highly rational process. It focuses on events, processes, and calculations. Managers focus on the current setting and control situations to achieve or exceed certain short-term goals. So what do managers do? Managers resort to the “push” principle. They “allocate resources,” “estimate effort,” and “calculate durations” regularly. They assign tasks, provide necessary guidance, and monitor and assess their employees’ performance constantly. Most importantly, managers have authority over their employees and usually provide work direction. So, how do leaders lead? Leadership is people-oriented. Leaders are different from managers because of their high levels of emotional intelligence. Namely, good leaders don’t necessarily focus on their employees’ skills and performance. Instead, they focus on their behaviors, interests, and attitudes. Leaders inspire. They contextualize ideas and encourage team members to look at the big picture. Leaders motivate people to follow their vision and become part of something bigger. They trust their employees and believe they are competent enough to make smart decisions on their own. Leaders motivate people using the “pull” approach, instead of pushing them. You can see from the two definitions that management requires one to ensure the day-to-day processes are completed in the most effective and efficient manner. Leadership, on the other hand, involves inspiring, creating progress, and ensuring the organization is viable many years into the future. As a new leader, there is a tendency to do strictly one or the other, however, it’s important to do both. As you keep that in mind, you can set day-to-day goals to be both an effective manager and a visionary leader. Look at steps you can take to make incremental improvements to make your organization better. AND, keep the big picture in mind. I have heard several examples of organizations that focused only on one of these two points and it led to their downfall. For much of my life, photography was pretty much synonymous with Kodak just as Google is with web search. That was until the digital photography revolution occurred in the early 2000’s. Kodak believed digital photography was going to be a short-lived phase and the film industry would continue many years into the future. We all know what happened though. Unfortunately, Kodak stayed in the film world and let all their competitors pass them by as they entered the digital photography age. Kodak was once a household name, but they were surpassed and have gone into obscurity. If Kodak’s leaders would have been more forward thinking with a vision like “Helping people save their memories for generations into the future”, they would likely have changed their photography business model to adopt digital photography and would still be a strong competitor. Likewise, if we as managers and leaders, only focus on management and forget about leadership, we will also go into obscurity. An additional word of caution. If we only focus on leadership and don’t manage the day-to-day, our organizations can also fail. Work to maintain a balance between the two. Every leader faces a variety of situations that involve different people and circumstances. And, that brings us to the fifth challenge of situational leadership. Leaders can’t handle every situation in the exact same way. They must adapt their leadership based on who they are leading and the situation. For example, leading a very experienced group of people is very different from leading an inexperienced group of people. With the experienced group, you can delegate and give challenging responsibilities. You can also create a complex vision that advances the organization at a rapid pace. Leading an inexperienced group, will likely differ significantly. The focus will be more on helping them understand their new roles and responsibilities, and you’ll work to integrate them into your organization. The vision won’t be as expansive because their learning curve is much higher and will require much more training. What’s important, and makes all the difference, is your ability to effectively identify each situation and handle it appropriately. 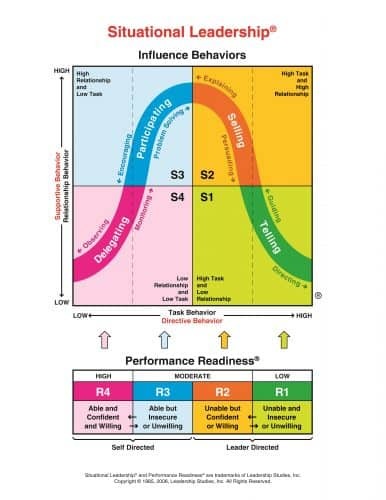 I really like the “Situational Leadership” approach and training by the Center for Leadership Studies. They have a graphic to describe situational leadership and it explains it very clearly. The graphic shows a line graph with an x and y-axis. The y-axis is labeled relationship behavior and the x-axis is the task behavior. 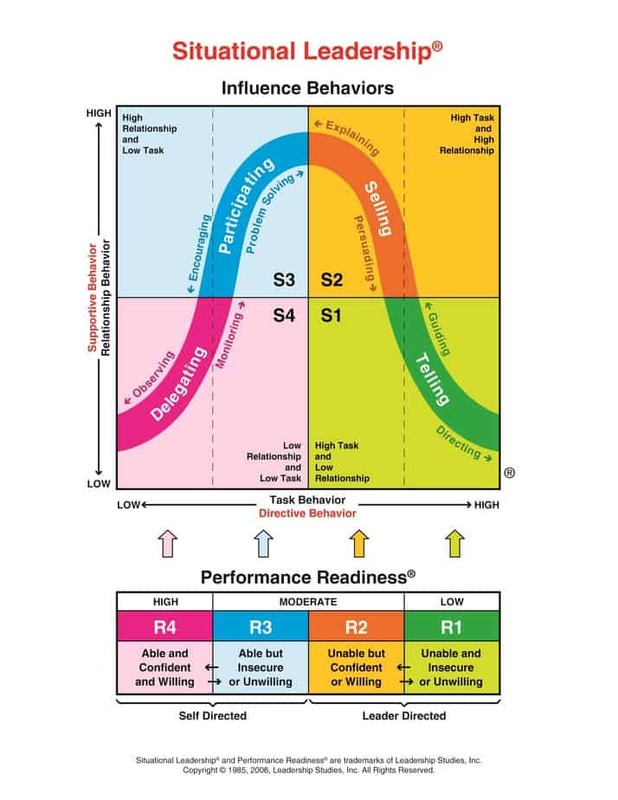 It is divided into four quadrants that relate the appropriate leadership style based on a high to low relationship and task criteria. I will include an image of the graphic in the show notes. The gist of it is that for new employees, the leader must give more direction and guidance than is required for more experienced employees. As a new leader, consider who you need to guide, direct, and regularly help. Also, identify those with experience that require limited direction. Spend more of your coaching and leadership efforts on those that need it and give the experienced people more challenges and opportunities to lead and grow. Understanding each of these challenges and then taking the steps outlined in this episode will help you advance the learning curve and improve your leadership as a new leader. 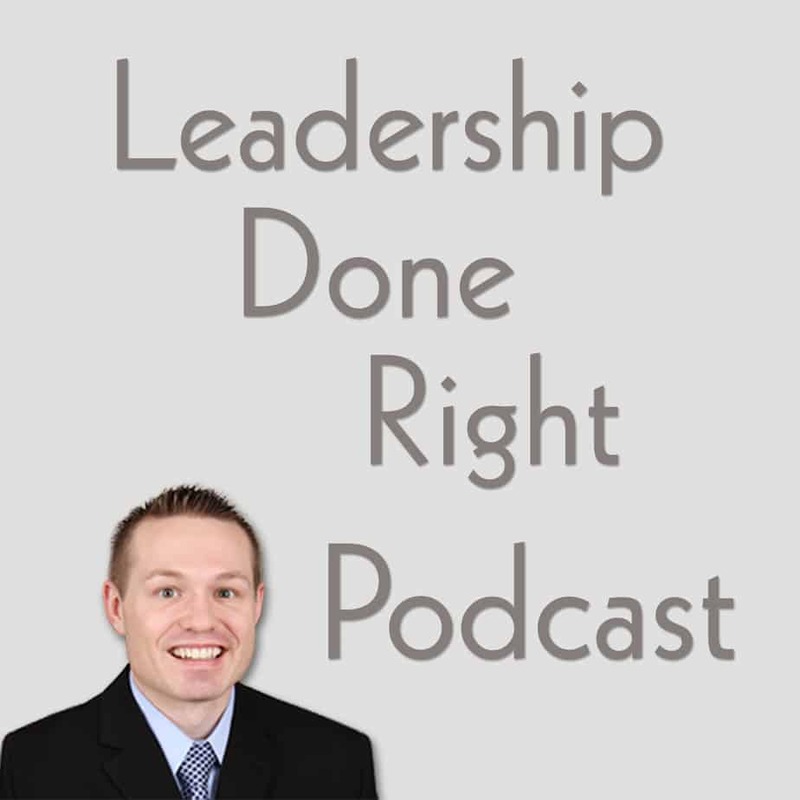 I want to finish this episode off with a short question for each of you as members of the Leadership Done Right community. What is your biggest leadership challenge as a new or experienced leader? I’d love to hear your thoughts either through a direct email to BrandonWJones@LeadershipDoneRight.com or you can share your thoughts in the comments section of the show notes. I’d also like you ask you a special favor. I am working really hard to get this podcast more exposure to help more people. If you enjoy this podcast, I would be so grateful if you’d share it with your social media networks, coworkers, and other friends and family. That would help many more people hear about this podcast and will grow the Leadership Done Right community.